The announcement Wednesday by the White House that the U.S. has defeated Islamic State (IS) in Syria and begun withdrawing troops from the country took many by surprise. The Syrian civil war, now in its eighth year, is further complicated by the actions within its borders by four other countries: the U.S., Russia, Iran and Turkey. FILE - Syrian schoolchildren walk as U.S. troops patrol near the Turkish border in Hasakah, Syria, Nov. 4, 2018. ​Why is the U.S. involved in Syria? The U.S. mission in Syria has always been to defeat Islamic State, which in 2014 took over vast swaths of Iraq and Syria. The United States has about 2,000 troops, mostly special forces, located mainly in northeast Syria. The troops act as advisers and provide support, including air power and weapons, for local militias, such as the Syrian Democratic Forces (SDF), which is also fighting IS. Washington had given support — weapons and training — to moderate rebel groups fighting the regime of President Bashar al-Assad, but ended that support earlier this year. The U.S. also leads a coalition of nearly 60 countries, the Global Coalition to Defeat ISIS, that has targeted IS and other extremist groups with airstrikes since late 2014. 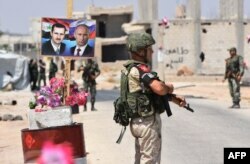 Members of Russian and Syrian forces stand guard near posters of Syrian President Bashar al-Assad and his Russian counterpart Vladimir Putin at the Abu Duhur crossing on the eastern edge of Idlib province, Aug. 20, 2018. Russia, a longtime Syrian ally, entered the conflict in Syria in 2015, offering the Assad regime weapons and air support, as well as troops on the ground. Some also see Russia’s involvement as President Vladimir Putin asserting himself on the world stage, and a way for Russia to be an influence in the region. When it began its air campaign in Syria, Moscow said it was targeting “terrorists,” which they said included IS and other terrorist groups. The U.S.-led coalition, however, said Russian airstrikes were targeting the non-IS rebel forces battling Assad’s government. Iran’s engagement in Syria began gradually since the start of the country’s civil war in 2011, initially in the form of providing military advisers to the Syrian regime. The engagement later morphed into a full-scale military intervention where the regime sent its forces and employed its proxies to fight alongside Assad to crack down on the various Syrian rebel groups in the country. By supporting Assad, Tehran has been able to maintain a regional presence against rivals Saudi Arabia and Israel. In October, U.S. lawmakers voiced concerns that Tehran might be in the process of establishing a long-term presence in Syria. According to a report published by the U.S. Department of State in October, Iran has spent about $16 billion to destabilize the Middle East by funding proxy wars in different countries including Yemen, Iraq and Syria. FILE - In this March 24, 2018, file photo, Turkish soldiers atop an armored personnel carrier secure the streets of the northwestern city of Afrin, Syria. Turkey has supported non-Kurdish Syrian opposition groups, such as the Free Syrian Army (FSA), since the civil war began. They fear gains made by Kurdish groups in Syria would embolden the Kurdish population in Turkey to seek independence. Turkey launched two military operations to help Syrian rebels recapture territory in Syria from Islamic State and the mostly Kurdish militia in Syria, the YPG, in August 2016 and January 2018. President Recep Tayyip Erdogan signaled earlier this month that Turkish forces may soon launch a new operation against U.S.-backed Syrian Kurdish militias in northern Syria, which is where most U.S. troops are based. While Turkey is part of the U.S.-led coalition battling IS, the cooperation between U.S. and SDF forces has strained relations between Ankara and Washington. Nisan Ahmado of VOA’s South and Central Asia division contributed to this report.